Knee pain is incredibly common among people now-a-days. Irrespective of the age, almost every one faces this problem, every year. Reflexology can help relieve this condition. This is done by working on certain reflex points in the body. By using massage techniques, one can help the body in releasing calcium deposits and reduce knee pain. For a few people knee pain may be so severe that they cannot perform their daily activities. If knee pain is ignored, there can be other problems which you need to face in future. You have a great opportunity to relieve yourself from knee pain through reflexology. The knee joint is the biggest joint in the body. It is the most vulnerable joint and does show signs of wear and tear. Knee pain is caused due to Osteoarthritis, Bursitis, muscle strains, Tendonitis, serious injuries to cartilage and ligaments. The spine acts as the support system for the whole body, which help take the weight of the knees. This spine reflex point is found on the inside portion of the feet. This point is located from the edge of the heel to the neck of the big toe. Hold your feet in your hands and run you thumbs on this point for at least 10 minutes. 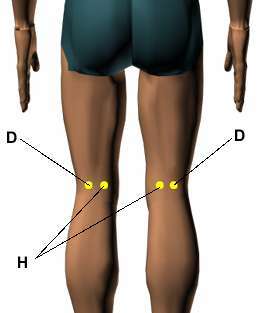 This point will help to strengthen your knee joint and heal any injuries in this area. This reflex point is found one inch below the ankle bone, it is located in a small and soft triangular section. Place your thumb on this point and move it up and down with some pressure. Make sure that you massage the points that feel sore and hard for 5 minutes. You will feel relaxed and pain free after regular use. This point is located on the outer side under the knee cap. Work on this area with your fingers moving in circular motions for 3 to 5 minutes. You need to apply some pressure on this area. It relieves your knees from any kind of stiffness and pain. This reflex point will help you get rid of knee pain, abdominal pain and also genital disorders. You need to place two fingers on the edge of you knee crease in the hollow between both the tendons. This is marked point A in the image. Now move your fingers up and down by applying a little bit of pressure for 5 to 7 minutes. You will notice that by doing this thrice a day, you will be free from the tension around the knees. Just 2 inches below your kneecap and one centimeter away from the shinbone, you will find the three mile point. Press this point with your index and middle finger for 5 minutes. This pressure point will strengthen the whole body. It will tone the muscles and also relieve you from knee pain. This reflex point has proved to be really effective for many people. It is not hard to find it as it is located at the edge of the crease on a bent knee. This is point B in the image. You need to apply pressure in circular movements on this point. If the massage is done properly for 10 minutes you will experience less pain and stiffness in the knee. This is a magical reflex point as it is used to cure and treat many health conditions. By accessing this point one can find relief from water retention in the body, swelling, knee problems, leg tensions, cramps, varicose veins and edema. 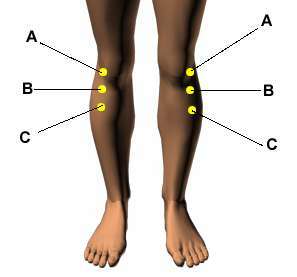 You can find this point on the inside of the leg, just below the bulge on the head of the shin bone. Place your index and middle finger on this point and press it for 10 minutes. You can release it after every two minutes and hold it again for extra pressure. You need to treat your knees with extra care. You can also pour five drops of rosemary and eucalyptus oil in a large bowl filled with tepid water. Add half cup of Epsom salt and mix it well. Place two small hand towels in this mixture and soak them for 5 to 10 minutes. Now take the towels and remove excess fluid from it. Wrap each towel around your knees. Redo the same procedure till you find relief in your knees. This is an additional strategy which will help improve the effectiveness of the reflex points. Try it out and get rid of the pain. All the above reflex points will ease your pain. Be patient and do them regularly for the best results. Take care of yourself and stay healthy. Knee pain can be caused by several reasons and those that are not due to serious causes can surely be healed with reflexology, but in case it is an advanced case of osteoporosis then one must seek special medical attention. Radial tear in posterior horn of medial meniscus. As informed by my doctor, that such tears are not self healing due to no or very limited blood supply to interior side of the meniscus and partial removal of the teared meniscus via camera surgery is the only option. Kindly guide me how Reflexology may help repair heel my damaged Meniscus, so that I may possibly avoid the surgery. Reflexology may not work effectively in such extreme cases and and its best to take help from professionals in such cases. I’m looking for a reliable source of acupressure therapy on knee osteoarthritis pain. Can you help me? I followed your advice i.e. Reflexology for knee pain and got instant relief. Gem Scholars like you are very very rare. I salute you out of adoration for you. Hey my mom is suffering from extreme knee joints pain and sciatica pain since from 2 yrs …she has unbearable pain while sitting or standing ..she cant walk properly..and can’t place both legs properly on floor…can reflexology work here…please guide…thank you.. Yes Reflexology can bring down the pain considerably. Great Blog man! And i know it works as 2 years ago i felt pain in my knee, and after visiting doctors and taking allopathic medicines it did not cure me well. And after wasting my lot of money and energy finally i made a mind to visit chiropractors for this treatment and i am shocked after seeing their results as this treatment heal my joint from saviour pain and after visitng few sessions now i am feeling very well. So i thought this is the best treatment for all of us. Yes, we have great faith in the healing properties of Reflexology treatment.